Enveloped, spherical, about 120 nm in diameter. 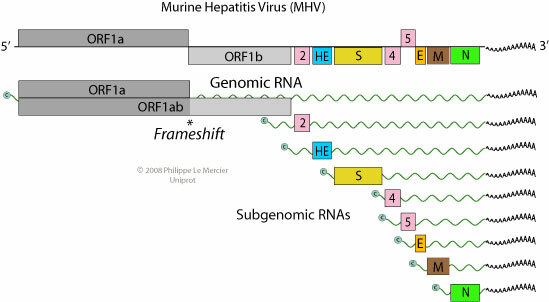 The RNA genome is associated with the N protein to form the nucleocapsid (helical for the genus coronavirus, and tubular for the genus torovirus). see Neuman BW et al. for virion cryo-electron microscopy analysis. Monopartite, linear, ssRNA(+) genome of 27-32kb in size (the largest of all RNA virus genomes). Capped, and polyadenylated. The leader RNA (65-89 bp) at the 5' end of the genome is also present at the end of each subgenomic RNAs. Genomic RNA encodes for ORF1a, as for ORF1b, it is translated by ribosomal frameshifting. Resulting proteins pp1a and pp1ab are processed into the viral polymerase (RdRp) and other non-structural proteins involved in RNA synthesis. Structural proteins are expressed as subgenomic RNAs. Each RNA (genomic and subgenomic) is translated to yield only the protein encoded by the 5'-most ORF. IBV also seems to induce apoptosis at late stages of the infection cycle . 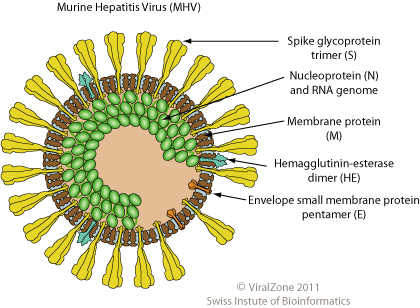 Infectious bronchitis virus (IBV), SARS-CoV and MHV nsp6 proteins induce autophagy to promote virus replication . IBV induces a both S-phase and G(2)/M-phase arrest in infected cells to promote favorable conditions for viral replication . SARS-CoV M protein mediates the inhibition of host TRAF3 . TGEV protein 7 may counteract host antiviral response . ASSOCIATED DISEASES Mainly respiratory diseases (pneumonia) and gastroenteritis.